A lot of people come to the San Juan Islands hoping to kayak with the orcas. 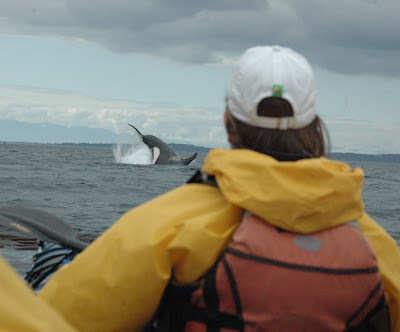 In reality, it doesn't happen all that often - you are a slow moving with a short travel distance in a kayak compared to the fast, 125-mile-a-day killer whales. When speaking on the phone to an expectant client last week, a kayak guide I know said "Honestly, you'd have better odds in Vegas" when referring to the chance of a close encounter with the whales. Well today, I rolled the dice - and I won. With many friends and family members in town this week I got a group together to go out with Western Prince's sister company, Discovery Sea Kayaks. Yesterday, the whales were out to the open ocean, but they came back in overnight. We got to our launching point and in the water just in time to see most of the whales continuing on their way well north of us. We rafted up in a kelp bed to watch the last few go by about 300 yards away from us. The last three whales in the group turned and came straight towards us. They were milling and foraging, so we figured this might be only a temporary shift in direction. But then they surfaced again, still facing right at us. Then again. Before long we were surrounded by whales as they split and passed on either side of the kelp bed we were in. One was feeding, changing directions often with its "fluke prints" visible on the surface. Another was playful, tail slapping, then pec slapping, then doing the cartwheel that I captured in the picture above. Everyone's hearts were pounding. One man from LA, who had never seen so much as a deer before this trip, had hands shaking so bad he couldn't even click his instamatic waterproof camera. The whole thing seems very dreamlike in retrospect. It happened so fast, yet the things we saw are frozen in time. Not just in my photos, but in all of our memories - I'll never forget it. What an awesome picture. It's even more awesome when one clicks on the photo and sees in in the large. The whale is in focus, the looming clouds, the kayaker's yellow rain gear in the foreground. No other word comes to mind. Awesome. Thanks for posting it. Stunning, stunning! What a great experience! I hope our paths cross sometime either here in Friday Harbor, or paddling in the water.